The fast growing field of mathematical biology addresses biological questions using mathematical models from areas such as dynamical systems, probability, statistics, and discrete mathematics. This book considers models that are described by systems of partial differential equations, and it focuses on modeling, rather than on numerical methods and simulations. The models studied are concerned with population dynamics, cancer, risk of plaque growth associated with high cholesterol, and wound healing. A rich variety of open problems demonstrates the exciting challenges and opportunities for research at the interface of mathematics and biology. 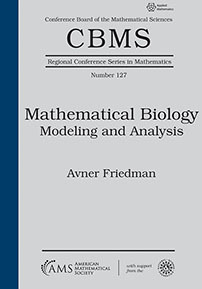 This book primarily addresses students and researchers in mathematics who do not necessarily have any background in biology and who may have had little exposure to PDEs. Graduate students and researchers interested in applications of PDEs to math biology. This small book gives a deep insight into the mathematical modeling of some carefully selected biological problems...The book is written in a very attractive style. Its reading proves very inspiring: its contents, bibliography and many open questions posed in the text may provide the reader with a starting point for further research.